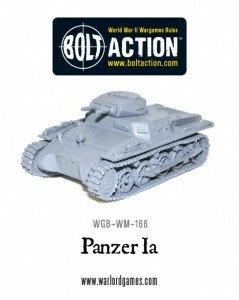 Warlord Games has released their new Panzer Ia for Bolt Action. Pick one up today, soldier! During the early stages of World War II, Germany’s light panzers, such as the Pz Ia, formed the bulk of their armoured strength. Fighting across most theatres which German forces took to the field, the Pz 1a was also found in some numbers fighting in the Spanish Civil War. See the latest addition to the Bolt Action vehicle range below.